The Oceanside Economic Development Commission this month approved a $1.5 million land sale to SD Malkin Properties for a two-hotel resort. This and an expected $13.5 million city subsidy will take the project closer to fruition — although financing is still being worked out. The Oceanside City Council still has to approve the land sale of the city-owned property next month bounded by Pacific Street, Myers Street, Seagaze Drive and Pier View Way, as well as the subsidy. Jeremy Cohen, an SD Malkin senior vice president, said the more than $150 million project is advancing. Greenwich, Conn.-based Malkin, which is securing the property under a 99-year lease, is pursuing a project very different from what developer and UT-San Diego owner Douglas Manchester proposed a decade ago. The California Coastal Commission sank Manchester’s plan for a single 400-room hotel over concerns about view blockage and waterfront access. 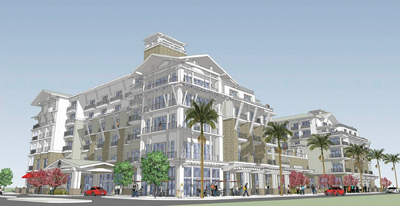 SD Malkin came in shortly afterward with an amended proposal for what became two scaled-back hotels, which was approved by the California Coastal Commission in 2009. Even so, Malkin couldn't find the financing to move ahead. The project, which has continued to be tweaked, now calls for 225 rooms for the part of the site south of Mission Avenue, plus about 135 rooms north of Mission. The six- to eight-story project, which is being designed by Delawie Architects of San Diego, will also contain about 18,500 square feet of retail space. Cohen said the land sale and the $13.5 million subsidy — mostly from city transient occupancy tax funds — should be able to kick-start the project. The project is to be financed by a construction loan from a bank, plus equity from SD Malkin and its partners, he said. A joint venture partner is also possible, depending on the amount of debt being carried. The name of a prospective bank lender was not disclosed. Cohen conceded the financing might have been easier to realize were it not for the forced dissolution of redevelopment agencies in early 2012 and the tax increment funds they provided. Although challenges remain, Cohen emphasized that SD Malkin still has the advantage of an oceanfront project that is already fully entitled. Financing hasn't been the only challenge. When the city insisted that a ballroom be part of the project, Malkin and Delawie were forced to use setbacks and angle the profile to preserve view corridors. "This wasn't easy, given the size of the blocks, view corridors and the open space requirements," Cohen said. The 225-room full-service hotel is expected to be flagged as either a Westin or a Hyatt hotel; the operator for the smaller hotel is also to be determined, he said. Cohen said he would like to see the hotels developed concurrently, but they could be developed in phases, depending on financing and other factors. Cohen said he is impressed with the Delawie design for the hotel. "The fresh take on California Beach Cottage architecture will be contextual as well as romantic," Cohen said. "The amenities of Oceanside's increasingly interesting mixed-use urban beach village, including Oceanside Museum of Art, Surf Museum, many new restaurants and microbreweries will all be in walking distance. "This vibe will be further enhanced once the hotels are complete, and the hotels themselves will incorporate multiple restaurants, a coffee house and street retail." The project will include the preservation of a Queen Anne-style Victorian that was featured in the 1986 film "Top Gun." The house will be preserved, moved and incorporated into the resort. "It is an historic resource and we agreed in negotiations with SOHO (Save Our Heritage Organisation) early in the conception of the project to rehabilitate the structure and relocate to the open space on the site," Cohen said "We also think it will be exciting part of the project." Construction could begin in late 2015 or very early 2016, with completion in late 2017. The Oceanside resort project isn't the only major hotel development the city is examining this year. International Swimming Hall of Fame Partners has proposed a 400-room hotel within the El Corazon master plan. However, many city officials have said the Swimming Hall of Fame proposal is incompatible with the passive and active parks being developed in the El Corazon plan.